For me, if I restart my computer, it works fine until another app uses audio. If that happens, then I have to restart my computer. I don't even have that. Different area. In Windows 10, right-click the speaker in the notification area, then choose Sound Settings, then click Device Properties (of your output device, not input), then click the Advanced tab. No problem! @acedude ^ seems this is a possible solution but I'm not sure if it's driver related or Subnautica related. @Chedman and @AceDude please let me know if the exclusivity checkboxes solved the issue from @0x6A7232 's suggestion. Thanks for following up @0x6A7232 , much appreciated. It solved the issue. It was ticked, so I unticked it and it works. However, I still have no luck getting the game to run properly, both the vanilla Subnautica and Subnautica: Below Zero. It's a shame because I wanted to enjoy this beautiful game again . Any response or help would be greatly appreciated. Thank you very much! Try using some USB headphones. That's the only temporary solution that's worked. any one getting this bug what operating system are you running are you all running windows 10 ? if you are running windows 10 what build are you using ? I'm having the same problem. This is my DxDiag:vCQfB3bK. The code is for pastebin. Could you help? I'm not putting in the actual link because I haven't been around the forums long enough. I'm seeing three output_log text documents. 2 of them are 1.30 KB but the other one is 15.4 MB. Which one should I send you? bing windows 10 what build are you using ? So i have also got the Esc/Bug issue, but i not also seeing the cinematic to begin with. I load into the game, the splash screen goes through the loading process and then hits me with a back screen saying " press any key to continue" i hit space and the black screen stays there. hitting escape drops a small bit of text to the bottom left saying " hold ESC to exit" and i do this and i exit to the main subnautica start page where i can start or load a game or access options. When i start any game type i load into the capsule, i can move around, and interact with object, even climb ladder and exit capsule and swim in water, but when i hit the escape key, i get the menu up and i cant click on anything, i can still move around the environment a bit, not very effectively, as the escape menu overlay block all mouse axis controls from then on. i cant exit this menu and have to windows key out to the taskbar.. right click and close the app. i have the pastebins for the files, but the forum won't let me paste as i haven't been a member long enough yet.... sort of silly i think seeing as steams refund policy is at odds with this if i want to get support. i've already gone through refund on subnautica a few days ago as i felt i shouldn't be wasting time on this, but im just drawn back to it, so if i can't resolve it this time round, i'll just refund and walk away. SystemNotInitializedException: FMOD Studio initialization failed : Calling initialize : ERR_OUTPUT_INIT : Error initializing output device. I'd really like to try this game out as it look very very cool. I've also unticked the use exclusively audio device as well, still no luck. I'm perplexed as to why i don't see the cinematic before hand either, when the games loading and the black screen appear, my gpu fan spins up, so something is actually trying to initiate a movie sequence loading but nothing appears on screen and no sounds either. Curiously, when i exit the pod, swim around, collect some scraps etc, then come back to the pod, i enter the pod and it locks my movements, weirdly it just send my char slowly climbing to ladder till i hit the top and can't move anymore, this is all before i hit esc button and lock myself into the downward spiral that many others report. even when i die of thirst inside the pod, it won't allow me to respawn or restart, i just have to taskmanager kill the application... sometimes i have to kill steam completely as it says the game is still running and won't allow me to restart. so installed and it made absolutely no difference to the game. still same bugs/problems. interestingly, my laptop power went out, so i had to connect power... but it suspended itself before i could connect... upon power up the sound was coming through the laptops speakers as the headset disconnected itself !!! so sounds was working fine. exiting the game and restarting the game gave me the same problems as before. reconnecting the bluetooth headset works and the game plays as it should. 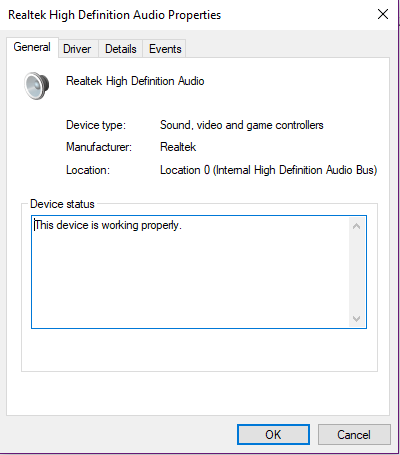 so the problem is realtek audio usage by the game. @devs if you need some experimentation or logs and stuff let me know and ill provide everything i can. Thank you all for the helpful info. I'm passing this along to the team. Can anyone experiencing this problem and who also has Subnautica: Below Zero let me know if they're experiencing this problem on there as well? @r0cksalt Can you set your power button to suspend (sleep) your laptop, reproduce the bug, sleep / resume, and verify that that is a workaround for the problem? Thanks @Acezblazelion for the offer, I may reach out to you directly. I spoke with Obraxis and he has had some experience with users having a very similar issue as this in the past. He made a point that I don't think I saw brought up here, but the manufacturers drivers for the soundcards did not solve the problem in the past and people needed to get their drivers directly from Realtek/C-Media. I went to check on Realtek's site and it can be a problem finding them, although they have a tool that is supposed to identify and download the latest drivers you need link. If anyone tries the direct driver approach from Realtek can you let me know if that solves the problem for you. Here is a link to suggestions for audio related issues (and more issues) can be found on the Steam Troubleshooting guide(applies to all PC versions of Subnautica). Hey @madsauce I tried what you recommended but it had no effect probably because ive already installed these drivers in the past (Or at least tried it said these were controller drivers so maybe it was the wrong link). I have the same problem except mine makes the game unplayable. Guys I found it! I have spent hours and hours trying to figure out my audio with the game and the pause/esc menu bug. I have been having the same problem as pretty much all of you combined, and I have tried updating my realtek and configuring setting for SO long. But I just found out that my problem was never WITH Realtek. There is a program called Sonic Studio that I suppose comes by default with what I assume are Realtek computers that is screwing it all up. I went into my task manager and ended the processes that started with "ss" and that completely solved it for Subnautica and many other games. Maybe your Sonic Studio 3 needs an update, or it just needs to be deleted. Pick your favorite, and I hope this solves all you guys problems.